Are You Being Served? showcased new work by the internationally renowned artist, Tom Hunter. Exploring the changing face of East End trade, these situational portraits of local businesses between Bethnal Green and central Hackney provided a fascinating record of the diverse proprietors, their premises and their wares. Despite the increasing homogenisation of the British high street, this part of London has managed to retain a distinctive local identity. The East End has always been an area of settlement and change, with new waves of immigrants arriving and establishing new businesses. The rich diversity of the local shops mirrors the diversity of the population. 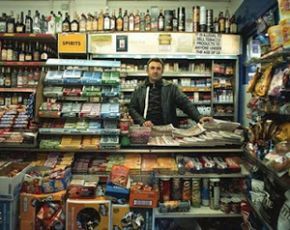 Tom Hunter’s work became the inspiration for artist-led projects with local children and adults who created a playful interpretation of the corner shop.